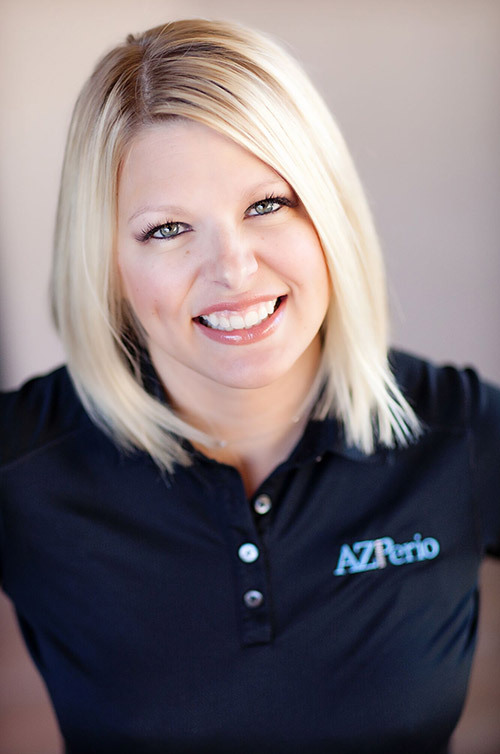 Dr. Holly McKnight joined AZPerio in 2013. She sees patients at the Central Phoenix and Pinnacle Peak offices. Throughout her training and practice, she has actively promoted and advanced dentistry through her involvement in several dental research and contemporary treatment pursuits, including the use of cone beam CT for diagnosis of oral and maxillofacial health and pathosis. She has presented her findings at national research meetings. While highly research-focused and committed to advancing the science of periodontics, Dr. McKnight is also a passionate advocate for patients’ health and wellbeing. She supports the HONOReform Foundation, a national organization to promote patient safety and access to healthcare, and she is an active member of numerous local and national dental organizations, including the American Academy of Periodontology. Dr. McKnight earned a Bachelor of Arts in Psychology and Doctorate of Dental Surgery from Creighton University in her home state of Nebraska. She acquired several honors and awards during her dental training, including induction into Omicron Kappa Upsilon, the elite National Dental Honor Society. She received a Certificate in Periodontics and her Master of Science from The Ohio State University. She is a Diplomate of the American Board of Periodontology. In her free time, Dr. Mcknight enjoys exploring the beauty of Arizona with her husband and children. "The most rewarding aspect of dentistry to me is knowing that I change lives every day by helping people have lasting, healthy smiles on a strong periodontal foundation."